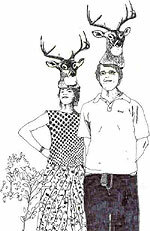 Hazel Meyer, Deer Heads, 2005. Ink on paper. Courtesy of the artist. The ideas and activities of “sub-cultures” are both integral to personal experience and the development of culture at large. My Culture Includes My Scene will explore how identities and cultural discourses are constructed and communicated now that diversity is recognized as being about much more than ethnicity. This exhibition will feature performance, sound and video, installation, painting and drawing, new media and interdisciplinary collaborations by 16 artists with ties to the Ottawa region. Exhibition Launch Party: Friday, June 24th from 8:30 – Midnight featuring performances by Stéphanie Brodeur & Darsha Hewitt, Hazel Meyer, Dipna Horra, Tibi Tibi Neuspiel, Tungda Browne, DJ Booth & Chameleonic, and more! Howie Tsui, Gang Troops, 2005. Acrylic on canvas.Courtesy of the artist.